The government’s support in the form of capital infusion also helped PNB to zoom back to profitability. The Centre has infused roughly Rs 8,200 crore into the bank, under its recapitalisation programme. The bank’s share was up by 0.55 per cent at Rs 73.55 on the BSE. The bank has provided the full amount for the fraud, Mehta said, adding that the “bank has the capacity and the capability to absorb the shock”. The bank has not sought for additional funding from the government, he said. The bank also cited “strong recovery” of bad loans as a key factor leading to profitability within a year of the biggest banking fraud. 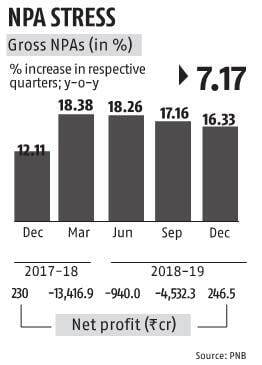 “The first quarter recovery stood at Rs 8,445 crore — unprecedented in industry, even more than the Rs 5,617 crore full-year recovery last year. Our recovery for the first three quarters (at Rs 16,600 crore) is three times the recovery of last year,” Mehta said.